The author studies infinitive constructions in Egor Letov’s texts and defines their scope of usage. The total number of infinitive constructions with clear modal values in Letov’s oeuvre is almost equal to the number of modally non-qualifying sentences. The infinitive sentences with their unique modal connotations excellently meet the goals set by the author. Keywords: syntax; the infinitive sentence; functioning; Egor Letov poetry. The article presents a quantitative and qualitative contrastive analysis of the expressive means for direct inducement in Russian and Chinese newspaper advertising discourses, finding out their similarities and differences, conditioned by the structural features of the compared languages and by the ethnic speech norms of the compared linguocultures. Keywords: newspaper advertising discourse; direct inducement; language tools; ethnic speech norm. The article offers a detailed analysis of political and legal discourse as a linguistic category, which is reflecting axiological and semantic systems of today’s society. This type of discourse is characterized by the contradiction caused by both ideological and historical mentality. Keywords: political and administrative vocabulary; legal vocabulary; political and legal discourse; political and administrative sociolects; Sovietisms; lexical markers for addressing people. The author argues that standardization and codification of literary language as the core of national Russian language are generally recognized in Russian studies, but the notion of the standard and the definition of the means of its codification are treated ambiguously, in both broader and narrower senses. The paper discusses these approaches to the notion of standard and to its codification, accepting the broader understanding of codification means and by formulating the thesis, that the codification means of written speech in the beginning of the 21st century is subject to change due to the development of electronically mediated communication. The article deals both with the fundamental issues of linguistics and with its applied (methodical) aspects. Keywords: codified standard and common language usage; means of codification; electronically mediated communication; meta-language reflection. The article is devoted to the study of the medical sphere of concepts in Russian language world-image. The authors define the basic Russian language concepts in the sphere of medicine and the methods of concepts’ linguistic representations, describing their functions in medical, advertising and PR discourses. Keywords: concept; medicine; discourse; Russian language world-image. The authors analyze the concepts ‘Motherland’ and ‘Home’ in Russian and Chinese linguocultures, including their application to metaphorical models, by using the methods of semantic, conceptual and comparative analysis. Electronic versions of Russian and Chinese newspapers and fiction books were chosen as material for this study. Keywords: concept; linguoculture; patriotism; political discourse; metaphor; semantic; conceptual and comparative analysis. The authors analyze the concept ‘memory’ in Ivan Bunin’s prose on the background of the Chinese language, and offer classification of ‘memories’ according to the thematic features. Bunin’s unique connotations of ‘memory’ are clarified by comparison with dictionary definitions of this lexeme. The article considers the mechanisms of semantic transformation of various text units’ meaning in the process of historical functioning. Being a part of linguistic and social universe, text field objectifies the results of subject’s previous speech activity, which have regulative and assessing value, defines the importance of the text in the system of other cultural phenomena in the society and thus produces a new sense unit using the same components. Keywords: linguistic and cultural meaning; intra- and intertextual connections; axiological dominants; linguistic and sociocultural field. The article is dedicated to the linguistic aspects of the transformation of Turgenev’s novel “Fathers and Sons” in its dramatic interpretations of 1900–2003. The authors demonstrate dramatic potential of the novel and conclude, that the nature of its transformation is due not only to socio-cultural factors, but also to the interpretation strategy chosen by a playwright. Keywords: dialogeme; drama; interpretation; novel; transformation; epilogue. The author analyze the landscape descriptions in the trilogy “A Legend in The Making” by Fyodor Sologub with the help of communicative grammar approach, and conclude that the specific feature of these fragments is a combination of nature description with the movements of the characters; the functions of this unity are also a subject of analysis. Selected fragments of the work are compared for detecting the linguistic characteristics of its counterpoint shaping. Keywords: Fyodor Sologub; “A Legend in The Making”; communicative grammar; communicative registers; perceptive modus. The article analyses functions of unoriginal Russian speech (the speech of a foreigner) in a literary text. The analysis of constructions, which are non-standard from a native Russian speaker’s point of view, gives grounds for describing an image of a foreigner’s speech, which does exist in the mind of an ordinary Russian native speaker and is reflected in the linguistic behavior of the fictional character. The methods of studies of the ‘heritage language’ phenomena and of studies of Russian as a foreign language, as well as of the studies of a lingua franca communication have been applied for the analysis the character’s linguistic behavior. As a result, the author demonstrates specific linguistic strategies, becoming the means of the hero’s characterization. Reader’s perception of the character’s image is projected onto the whole meaning of the work of fiction. Keywords: varieties of language existence; unoriginal Russian; heritage language; foreign language speaker; lingua franca; literary text. The article explores the peculiarities of the first-person narration in modern fiction, where the communicative structure of the text is the base of language means’ formation. The author-narrator’s speech, being oriented to everyday communication features, becomes a key point for modern human being understanding. Keywords: modern fiction; first-person narration; author-narrator speech; everyday communication. The article presents the results of the research project “Pushkin Institute Interactive Author’s Courses” and describes five components of the courses, the goals and the structure of each course, their target audiences, author’s methodology and its implementation in online training, etc. Keywords: open educational environment; online learning; Russian language; author’s methodology; interactive lessons. 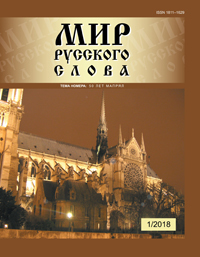 The article is dedicated to the conceptual base of the new generation textbook on linguoculturology “City of Peter, Just You Shine”: the Views of Saint Petersburg”. This textbook combines the cultural component, historical context of Saint Petersburg cultural life’s dynamics, and interactive and communicative structure. The textbook gives the foreign students information on cultural and historical spaces of Saint Petersburg and gives a possibility to use the acquired knowledge in the process of intercultural communication, to activate conversational Russian language skills. Keywords: dialogue of cultures; intercultural communication; cultural spaces of Saint Petersburg; historical context, interactive principle. The article is devoted to the problem of organizing symbolic and non-symbolic interaction of foreign students in the process of studying Russian at short-time courses. The textbook “What if…?”, developed by the authors, offers training exercises, allowing the interlocutors to develop direct reactions to each other’s speeches, and to exchange information in various forms. Keywords: interaction; “What if…?” textbook; interactive exercises; Russian as a foreign language; short-term courses. 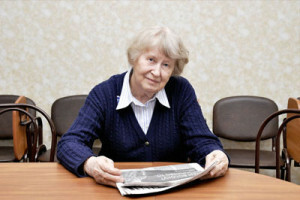 The article reveals methodical potential of folklore and dialectological material from Novozybkovsky District (Bryansk Province), and shows that it can be used in the process of teaching at the lessons of Russian language and literature, allowing the high school students to study the regional language features on the example of works of folklore, to get acquainted with the “Bryansk Province Dictionary”, and to expand and deepen their ideas of folklore genres, national and Christian holidays. Keywords: dialect features; folklore; Novozybkovsky district (Bryansk Province); didactic unit; linguistics and folklore. Rudiakov A. N. Georusistika: russkii iazyk v global’nom mire [Georusistika: Russian Language in the Global World]: Monograph. — Moscow: Lekrus, 2016. 320 p.